Trash and other refuse would whiz through a pressurized tube running along the bottom of the High Line. CHELSEA — Garbage trucks, trash heaps and litter-loving rats could be a thing of the past for a swath of Chelsea if one company's plans come to fruition. A sustainability-centric firm called ClosedLoops is looking into the feasibility of a “pneumatic" waste-collection system on the High Line. Trash, recycling and organic material from the High Line would whiz through a tube running along the bottom of the elevated park, drop into containers at West 34th Street and 11th avenue — near the Javits Center — and travel out of the city on rail cars to waste and treatment facilities, ClosedLoops team member Benjamin Miller said. The system is akin to “a giant vacuum cleaner with a miles-long hose,” Miller told a Community Board 4 committee on Thursday. “These systems run… without labor, they run without trucks,” he said. A similar system of pneumatic tubes — this one installed underground — currently collects trash on Roosevelt Island. 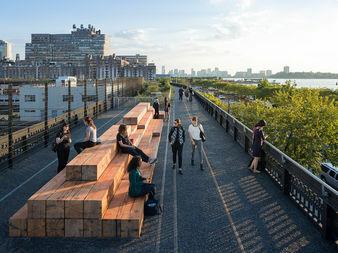 In one version of the plan, pedestrians could deposit litter and recycling directly into inlets along the High Line that would replace the park’s current trash cans, ClosedLoops team member Juliette Spertus said on Friday. Once the inlets were full, fan-like turbines would start up, generate air and force refuse through the tube below the park to the collection station, where the air would travel through a filter and be released, Spertus said. Trash and recycling would go into different containers, she added. “The collection station doesn’t smell, and it means that you don’t have the same issue of cleaning, and odor control, and vermin, and all those hygiene issues that you have when you have open garbage,” she said. ClosedLoops is still working out the logistics of transporting the waste out of the city, but envisions using the Empire track, which runs north on the West Side of Manhattan and is currently used for Amtrak trains, she said. The system along the High Line would likely cost more than $8.5 million, but could eliminate truck traffic in the area, improve air quality, reduce the use of waste transfer stations, and cut energy costs and greenhouse gas emissions, in addition to other benefits, Spertus said. The city could potentially finance the project, but her firm has also looked at models that would involve private ownership of the system, she said. Ideally, businesses and residential buildings along the High Line would send their waste into the system too, Spertus said. Her firm considered other locations in Manhattan for the pneumatic tube system, but decided the High Line would be the easiest place to pilot the project. “We thought this would be a great place to showcase this strategy,” she said.